The White Mountains are located on the border between California and Nevada, rising more than ten thousand feet above the surrounding desert1. Situated on the rain shadow of the slightly higher but much more famous Sierra Nevada, the White Mountains receive very little precipitation. 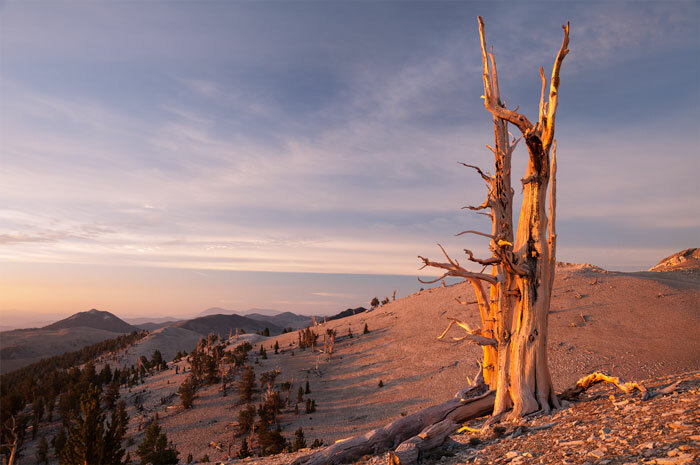 They are stark, arid, and inhospitable, yet thriving in this harsh environment, and subject to extreme conditions of both drought and cold, are groves of some of the Earth's most extraordinary and long lived trees: the western bristlecone pine2. Bristlecones are not lofty beauties; few grow taller than 30 feet. Instead, they enchant us with their stout, gnarled trunks, knotted limbs, and golden-hued wood. Clinging to steep, dry, rocky slopes, the trees are impressive models of economy, stamina, and tenacity. Bristlecones grow very slowly, often less than an inch in diameter per hundred years. Sculpted over centuries by wind, blowing ice and sand, and occasionally fire, many bristlecones develop unique and exquisite shapes. The bristlecone pine exhibits a variety of adaptations that allow it to survive, and even to thrive, in such a severe environment. Unable to tolerate competition from many other plants, it does best in the arid, alkaline, dolomitic soils of these mountains, where there is a paucity of competing plant species. The tree's shallow root system is also well suited to this nutrient-poor mountain soil. It favors slow growth, a necessary component in the bristlecone's longevity. Where growing conditions are most restrictive and adverse, bristlecones tend to live longer. Bristlecones that are more "deprived" of available moisture and nutrients produce wood that is more dense and resinous, and therefore more resistant to disease, fungi,and insects. Specimens located on exposed, dry slopes usually survive more than 2000 years, while those in more protected areas live an average of 1200 years. Even after most of a bristlecone pine is dead, a portion of it may continue to grow, deriving sustenance from a mere strip of living tissue. The wood of dead trees, such as the one in the image above, remains intact for thousands of years because of a compact cell structure preserved with abundant resin. Bristlecone pines are very picturesque and relatively easy to photograph in the soft light immediately before and after both sunrise and sunset. The hardest part, by far, is to get there. The rocky road is long, tough on your vehicle, and full of turns3. Camping is forbidden in the reserve that encompasses the trees, which leaves most folks with a ninety minute drive in the dark to the closest campground, and sixty extra minutes to the closest settlement of any kind. The only alternative, obviously the one I took, is to sleep at an even higher altitude past the boundaries of the reserve. That leaves you with a very cold and windy dreams and an astonishing clear view of the stars. I woke up very early and reached the highest trees a good thirty minutes before sunrise. Then I took lots of beautiful pictures shivering non stop, until the Sun appeared over the horizon one or two minutes before I took the one above, and I could start to warm up. On my return tree to the vehicle not that long afterwards, I already did not have enough hands to hold my down coat, fleece, winter pants, gloves, etc. I do not envy the bristlecones. 1The text on this page is mostly taken from the book "California's Eastern Sierra, A Visitor's Guide, written by Sue Irwin, and published by Cachuma Press. 2The oldest known continuously growing organism in the world is a 4700 year old bristlecone pine located in the White Mountains. 3Continuing with tradition, I again had the pleasure of riping a tire on my return drive.